It’s going to be largely lost in the ether, because the Royals mounted one of the greatest comebacks in recent postseason history. But with your kind dispensation, I would like to revisit what’s been the second-most controversial play of this championship tournament, so far. It was the seventh inning and the Royals were losing by one run. Terrance Gore, on the roster solely as a pinch-runner, pinch-ran for Salvador Pérez and stole second base. Then he stole third base. First, it’s crazy-obvious that Gore beat the throw, then executed a perfectly standard pop-up slide. Well, I’m not sure that anyone can say with perfection what it was “meant for,” except to get the majority of the calls correct, according to the rule book. And the book says, you know, if you’re tagged when you’re not touching the base, you’re out. How on earth do you write a new rule, or even a guideline or instruction to the review official, that defines how far off the base isn’t too far? Yeah. Good luck with that one, too. You know what should really happen? And will, eventually? Not less replay. More. More replay. If you already watched the video, I’d like you to watch again. Again, that doesn’t actually apply here, since Valbuena hardly impeded Gore’s progress. But I will come back to this in a moment. 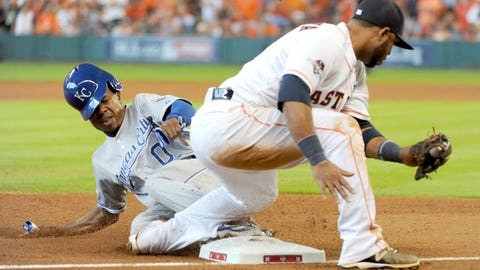 At the 1:54 mark, it sure looks as if Valbuena gave Gore just enough of a little shove to get Gore off the base. From other angles, though – and especially the shot at 2:01 – it looks like Gore came well off the base, and mostly on his own. And if that’s the case … well, dammit, he deserved to be out. Starting your slide later gets to the bag sooner, which is an advantage. But the disadvantage is the relative difficulty of staying in touch with the base. As it should be. By the way, you can argue that Valbuena never actually touched Gore with his glove, but rather with the back of his wrist; and for that reason, the call shouldn’t have been overturned. Maybe. But I don’t want to worry about that now. My point is this: If we’re going to turn over the judgment to the officials in the dark room in Manhattan, then let’s LET THEM USE THEIR JUDGMENT. Sunday night, Joe Torre excused Chris Guccione’s non-call of interference on Chase Utley by saying everything happened so quickly that it was a tough judgment call. Verily! So why not let the opposing manager challenge Utley’s actions? Anyone, and I mean anyone, watching the replay knew exactly what Utley was up to, and what he was up to is explicitly against the rules (even if the rules could and should be even more explicit). Similarly, while it’s very difficult to employ video review and allow runners like Gore to come off the base, how’s about allowing the review to ensure that fielders aren’t illegaly blocking the base, or helping the runner come off the base. By the way, you might be surprised to learn there’s not a rule that specifically prohibits a fielder from shoving the runner off; there probably should be, but it’s a difficult rule to write. So instead the most blatant cases simply fall under the heading of “unsportsmanlike conduct,” which is why you don’t see it happen even more often than you do. Not that it did Ron Gant any good. Bottom line? Things do happen too fast for the umpires to see. Or at least that makes for a fine excuse. But there’s simply no excuse for letting a runner destroy a shortstop at second base, or for letting an infielder pull a runner away from the base. If the umpires on the field can’t or won’t make those calls, someone else should.